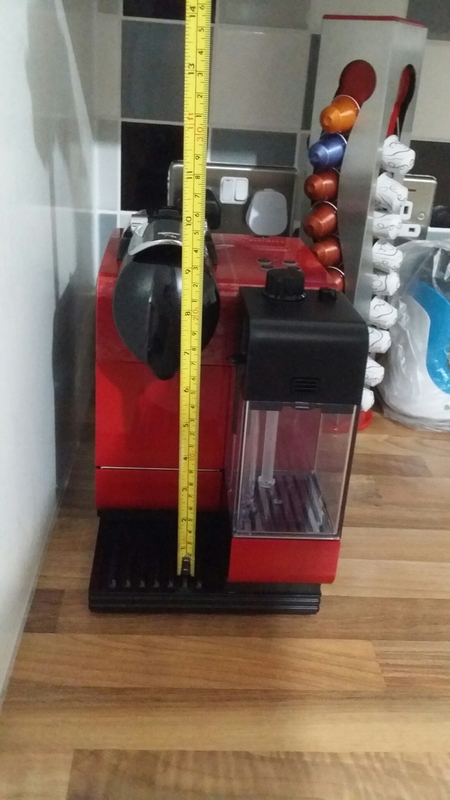 Quick post about my new coffee machine we bought, the Nespresso Lattissima Plus. We already own an espresso machine but it’s not ideal to use in the morning before you go to work, there is just too much cleaning involved. Hence why we bought a pod type one. It’s quick to make the coffee – makes one within 2 minutes from pressing the on button. This model EN521.R has four coffee modes – espresso, lungo (basically a long coffee) , latte and cappuccino. The milk unit can be removed and stowed in the fridge, so your milk is not wasted. It’s recommended that you run the 10 second clean cycle before you stow the milk unit into the fridge. I’ve taken a measurement here if you want to buy your own latte glasses, 14.3 cm max height without having to tilt the glass. It does not fit the traditional ones we had, we ended up having to buy some shorter ones. You can customise the amount of milk the latte and cappuccino options dispenses, the default latte setting will fill a 250ml glass to the brim.